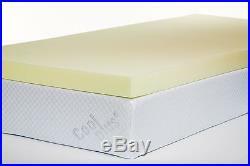 Memory foam mattress topper. 1″, 2″, 3″ or 4″ available in 3ft single, 4ft small double, 4ft6 double, 5ft king & 6ft super king with or without a coolmax cover. 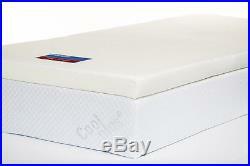 Memory Foam Mattress Topper – All standard sizes. Available in 1″, 2″ 3″ and 4″. Thickness’s with or without cover (please select above). Products shown in picture is our 3 mattress topper with & without cover. 3 ft Single. 4 ft Small Double – 75×48. 4ft 6 Double. 6ft Super King. 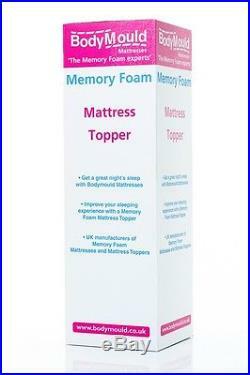 Memory Foam Mattress toppers are an excellent way of giving your old uncomfortable mattress a new lease of life. You simply lie the Memory foam on your existing mattress and it’s as simple as that. All the thickness we offer will give you all the benefits that Memory Foam has to offer but the thicker you can go the better with 4 regarded as the maximum. This is not essential and does not add to the benefits of the Memory Foam but it does however give the topper a more complete look and some would say nicer finish to it whilst also helping to protect the mattress topper. You won’t get this service anywhere else! MANUFACTURED IN THE UK. All of our products conform to the current U. K fire regulations and are manufactured in the UK. HOW CAN MEMORY FOAM HELP? It encourages better blood circulation around the body. Reduces pressure on nerves. Better comfort can reduce movement during sleep. Can reduce pressure on the spine and back. Reduces tension in the neck. WHAT IS MEMORY FOAM? Technically’memory foam’ is a visco-elastic polymer, which means it is slower to recover from compression than traditional polyurethane foam products. How does it work? The visco-elastic polymer foam is energy absorbent and also temperature sensitive so that it readily responds to heat, moulding itself perfectly around the source of compression. No matter what the weight, memory foam spreads it evenly by increasing the surface area so that when equilibrium is achieved, pressure is reduced to an absolute minimum. As the polymers come into contact with a warm surface they react to the temperature which softens the material and allows it to mould itself around the shape. This increases the contact surface area and helps to distribute the load, thereby reducing pressure and increasing comfort. Our mattresses are delivered with Nightfreight which are delivered between 8:00-18:00. If this amount is not automatically added when you checkout we will contact you separately giving you the option to pay the additional amount or cancel the order. Safety of our foam All grades of our foam are suitable for use in domestic applications and comply with the requirements of schedule 1, Pat 1: The Furniture and Furnishings (Fire) (Safety) Regulations 1988 (Amended 1989, 1993). Technically all of the grades are classified at least S according to the fatigue classification set out in BS3379:1991. This means that our mattresses conform to these British standards BS5202 Standard Series BS7176 Standard Series BS7177 Standard Series. The item “Bodymould Standard Memory Foam Mattress Topper Single, Double, King & S King” is in sale since Tuesday, December 23, 2014. This item is in the category “Home, Furniture & DIY\Furniture\Beds & Mattresses\Mattresses”. The seller is “bodymouldmattresses” and is located in Horsham. This item can be shipped to all countries in Europe.